This post is part of a series of travel posts about our May vacation to Colorado. Day Four of our Colorado Adventure was filled with so much adventure I had to divide it into three parts. Today is Part Two, if you missed Part One, go HERE, and if you need to start from the very beginning, go HERE. After spending the morning walking around the sweet city of Golden, Colorado my husband wanted to take me up yet another harrowing mountain drive. My regular travel post readers will know by now that I am terrified of heights and my husband seems to always disregard that and insists on going on these narrow, terrifying, mountain roads whenever were on vacation. I scream "NO! ", but somehow the car always seems to go "UP" anyway, and today was no exception. LookOut Mountain is a scenic mountain drive and overlook that gives you beautiful views of the city of Golden and the White Capped Rocky Mountains. LookOut Mountain itself is actually a 'foothill' on the eastern flank of the front range of the Rocky Mountains. So yes, although I was nervous, and it was still a scary experience for me, the drive up 'the foothill' was no where near as terrifying as driving up to the top of Mount Washington or Trail Ridge Road. But for a girl from Wisconsin, that 'foothill' was still WAY UP THERE! These four pictures (top three and bottom picture) are what you see from the scenic overlook once you've reached the top. You can see a bit of the road that takes you up to the top of LookOut Mountain, and the snow capped peaks of the Rockies in the distance in the pictures above, and the picture below is the city of Golden. You can also see Downtown Denver from the top of this mountain (not pictured). At the top of LookOut Mountain are a multitude of other activities: there are nature and scenic trails to hike, a Nature Center and Preserve, and the Buffalo Bill Museum and Grave. We did not visit the museum because we were pressed for time but we did go in to use the restrooms and took a few pictures of the lobby. The grave is free and open to the public, and was only a short hike from the scenic overlook, so we did stop and see that. Although Buffalo Bill was born in Iowa and spent most of his life in Kansas and further west, it was his wish to be buried on top of the scenic LookOut Mountain. 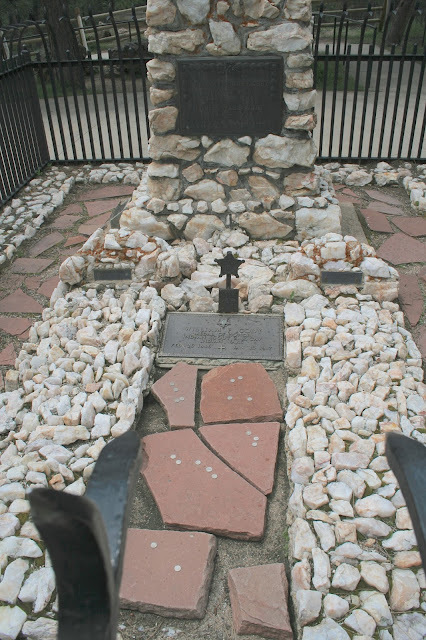 Of course, there is a lot of controversy surrounding his burial and some conspiracy theories that he is really not even buried here at all and he his actual body is on Cedar Mountain in Wyoming. I don't know what to think, except he sure must have been a popular guy that everyone wants to lay him to rest in their state! In addition to the museum and grave there is also a gift shop where you can find anything and everything "Cowboy and Indian" and other completely "politically incorrect" western paraphernalia. The Pahaska Tepee Cafe is located right next to the gift shop and they offer Buffalo entrees, Burgers, ice cream, and homemade fudge. We were still full from are all-you-can-eat pizza buffet lunch, so we didn't indulge in any of their delights. Although someday I would like to try a buffalo burger, for I have never had buffalo meat. I've heard it is a much leaner, healthier meat. By now half the day was over and it was time to head to our actual destination: Black Hawk, Colorado! It was time to end our little detour to the Golden City, and proceed on our journey. And by the look of the road below, it was going to be quite the journey for that was the road we took to Black Hawk. Such gorgeous views; thanks for sharing, lady! Amazingly beautiful scenery! Sounds like a fun day!